Study Hacks writer and Georgetown professor Cal Newport recently released one of the best books I've read in awhile, So Good They Can't Ignore You. In it Cal describes his "career craftsman" philosophy which is pitted against the "passion hypothesis" (the idea that finding your passion is the key to happiness). Instead, he thinks the way to a fulfilling and meaningful work life is the slow and steady accumulation of expertise and skill in a specific domain. By picking a general domain of interest and then dedicating oneself to systematic improvement in the constituent skills and techniques that make up that domain, Cal postulates you're much more likely to end up with a career you love. This goes against much of the advice peddled by well-meaning adults and advisors to "follow" or "find" your "passion." This tends to set up young people for disappointment and anxiety when a well-defined and socially worthy passion doesn't magically appear in front of them. I think Cal has hit upon something important in his philosophy. Not only does it "feel" right to someone who has been frustrated with his past adherence to the passion hypothesis (i.e. me), but one of the most key concepts in positive psychology fits with it very well. Mihaly Csikszentmihalyi has carved his niche in the psychological literature with his investigations into what he calls "flow." In the 1970's he began studying people who partook in activities for seemingly no reason other than intrinsic motivation. He looked at rock climbers and painters who weren't gaining fame or wealth but still pushed themselves to physical and mental extremes. How can someone become so wrapped up in a painting or a chess game that they lose track of time or forget to eat lunch? His inquiries into this concept led to the development of flow, or the psychology of optimal experience. One of the best ways to think about flow is to think about the interplay between skill and challenge. If an individual is partaking in an activity that is far more challenging than their current skill level, they are likely to experience anxiety. If they are doing something that is very unchallenging and they possess a lot of skill in the domain, they are likely to be bored or apathetic. There is a "sweet spot" or channel where an individual's skills and the challenge presented by a task are in balance. This is when people are likely to experience flow. In order to stay in this flow channel an individual must gradually seek out greater challenges as their skills increase. The longer you do something the more you build skills (especially if you're engaging in deliberate practice). If the challenge of the activity remains stagnant then eventually you drop out of the flow channel and experience relaxation, boredom or apathy. However, if you're able to tweak the activity or find a new aspect of it to focus on, you can keep increasing the challenge as your skill improves. I believe this is what Cal is talking about in his career craftsman philosophy. A career craftsman constantly finds ways to uncover new elements of challenge as she develops her skills in a domain. If you're a regular of Cal's blog, however, you may be asking, "Wait a second, I thought Cal was critical of flow?". Cal is critical of flow because the work that often builds skill is not effortless or time altering or unselfconscious -- all components of the flow state. Instead, it's hard, frustrating, and a constant battle. 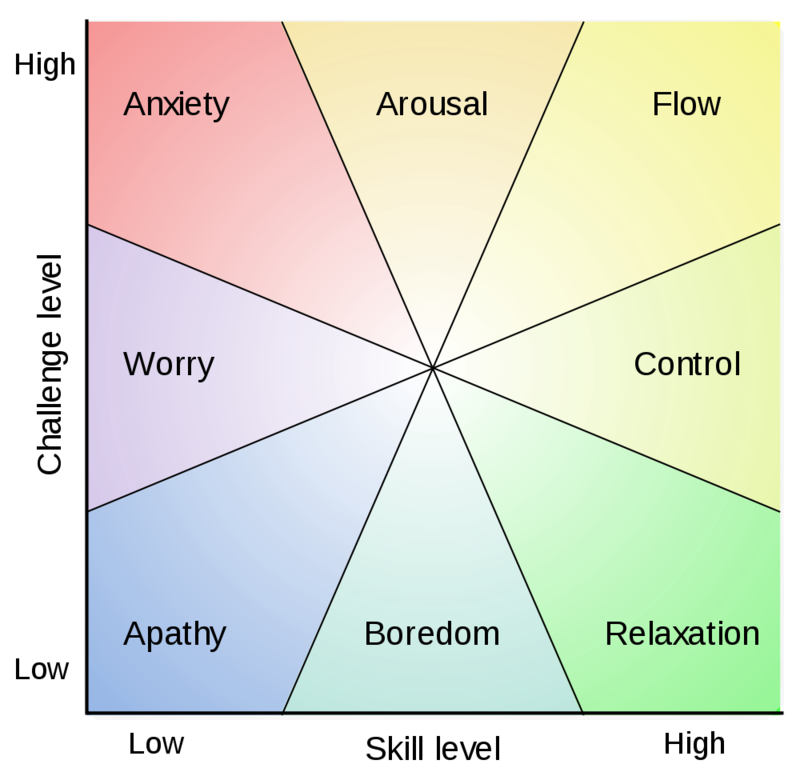 What Cal describes in the article above is what I believe to be the "arousal" state in the flow model. Arousal is experienced with the perceived challenges are just outside the current skill level. It's not a necessarily pleasant feeling but is instead characterized by a conscious effort of striving to master something very difficult. I think Cal's right, the largest gains to be made in terms of skills are when time is spent in the arousal segment of the flow model. However, this is not a sustainable mode of work. It is something you can engage in for a short amount of time but if you spend all of your productive time in this state you would likely experience burnout and exhaustion before long. It is the steady balance between arousal and flow, between skill and challenge, that allows the career craftsman to constantly move forward in his or her domain. You don't need a specific passion to experience flow. Indeed, the most powerful aspect of the idea is that it's possible to experience flow doing nearly anything. It's an exercise in attention control that can be practiced and refined. Likewise, the career craftsman can craft a worthwhile career in almost any domain. The career craftsman needs a myriad of tools available in the hard work of crafting a meaningful work life. I think an understanding of flow theory is an important -- maybe even vital -- tool in that collection.